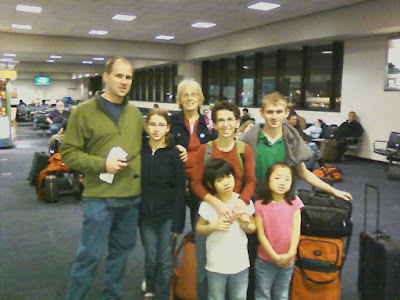 On November 26 my family and I left on our journey to Southern China, Guangzhou City, where we met and adopted our 9 year old daughter, Shanna. 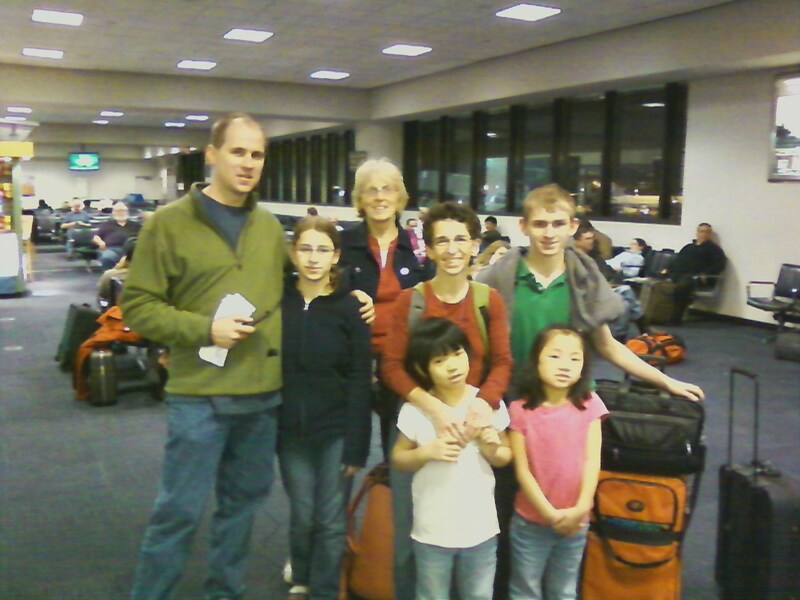 We returned safe and sound as a family of 6 on December 11. I wanted to share some photo highlights of our trip. Thank you all for you patience while I am on my "maternity leave". I am so thankful for the time off, as there has been much to do to since we returned home, especially in the midst of the holiday season. My whole family is doing great. The children have all gotten to know and love one another and it is rewarding to watch them interact on all levels. Shanna is a delightful child, full of joy and promise. She is a fast learner, and though she speaks Mandarin, she is learning English very quickly. She loves books and dolls, puzzles and all sorts of fun. She will start school on January 3rd and cannot wait!!! She asks me every day when we put her little sister on the bus "Shanna school??" I was a little afraid of how I would feed her, but she seems to be happy with the American dishes and is learning to eat things like raw carrots, cheese sticks, mashed potatoes, etc, all textures and tastes that are new to her. She eats well with chopsticks and is slowly switching over to fork and spoon. She is very proud of herself for learning all these new skills. Having four children in the house fills up every corner, so from an organizing and time management perspective, it has been a challenge and as I always tell all of you, it is a process, not an event (for example- I woke up at 5am to get this post finished and make the final menus for Christmas Day dinner and the next day brunch-I have to hurry before tiny feet pad down the stairs!). Unfortunately, my basement flooded while we were gone, and the carpet had to be ripped up, so that created even more chaos. I am following my own advice and focusing on the most important things that need to get done, (laundry, meals, school preparations and things with deadlines). One of the most helpful things I did was to box up anything I do not need in the here and now and stack it in a corner so I can deal with it when I have a minute. I labeled each box so I knew what was inside and I only put things in that I knew I would not need to see for 6 months or I simply did not know where to put. I collected my 2+ weeks of unopened mail in a clear, shallow bin and opened and sorted it as time allowed. Despite all of these strategies, there is still much that I just have to let go of, and I hope that it helps those of you who can relate to this know that even with the best of plans and ideas, it is still challenging to stay organized. Hang in there, do what you can and have a positive attitude. Call me if you need help! I am looking forward to contacting the people on my waiting list mid-late January. Packing to go!! Space bags!! Actually these are not brand name, but click here and see them. They worked out great and were much cheaper. It took hours to get everything in the right place! But somehow we did it. Somewhere over northern China/Russia. 14 hours of flying- Newark to Beijing over the North Pole!! Shanna being brought in by a nanny to the Center of Adoption Affairs just before we met her. Proud Mei Mei- little sister! And GeGe (guh guh) Big Brother. Getting to know each other and looking through her backpack. Proud Jia Jia (geeuh geeuh) big sister. It's like a pile of puppies on Daddy. They just love being together. The beds were narrow, but the girls were fine with that. A photo with our Guide, taken on the grounds of the hotel. Dancing is a very popular activity for older Chinese people in the park. They retire around 60 and gather to play cards, dance and play music. They welcomed us in and taught us their moves!! Many people bring their birds in cages to the park for fresh air and companionship. A beautiful statue to pose with. Almost done with all the steps. Consulate is the last stop to get the visa home for Shanna. When she arrives in the US she is a full US citizen! Waiting in Newark for the flight home. Tired, but very happy. Cake made by our dear friends who had a party for us the next day. The kids and Eric look great. I need a nap!! Fun at home with Bitty Babies!! Fun in the snow- Quite a change from tropical Guangzhou which has a climate like Florida. Getting to know the gerbils- she calls them "me louw shoe" which means "Mickey Mouse"! The joys of family. They cannot be measured. Every child deserves one. Linda, thank you for sharing the beautiful pictures of your journey and joyful adoption. Your family is very generous and kind to do this, and I can see why any and every child would want to be a part of your family. The last picture brought tears to my eyes. Have fun! Linda, Thank you for this lovely story of family and love. You and your family are beautiful examples of love in this world. Thank you again, I have tears in my eyes. You have moved me. Happy Holidays. Much love to all of you. I stumbled across this cite while looking for places to make donations in Buffalo. I have considered adoption and must thank you for your pictures. I got a little teary eyed by the end. Thank you for giving Shanna a home and the warmth of a family that EVERY child needs and deserves.